On a bitterly cold night in Mönchengladbach it was the hosts who raced into the lead – two nil up at halftime and cruising they looked assured of victory, but a monumental second-half fightback from Florian Kohfeldt’s side saw Gladbach vs Bremen end in a thrilling draw. It took Gladbach five minutes grab what was only their fifth goal of 2018 – Denis Zakaria dispatching the ball into the far corner of the net after Thomas Delaney decided to play a one-two with the midfielder inside the area. Only the Danish defender will know what he had originally planned to do – the execution of his idea, however, was dreadful but he would go on to have a sublime second half. Die Folhenelf have had a torrid time of late, only managing to pick up three points from a possible 18, but for the opening quarter it was all about the hosts – their dominance briefly interjected by a solitary Bremen chance. Ludwig Augustinsson found space inside the 6-yard box but the left-back could only watch on in despair as his effort was blocked on the way to goal. On the whole though, the visitors presented a lifeless cold display matched only by the weather inside the stadium. Lars Stindl – without a goal in 1154 minutes – worked hard on the left in unison with Thorgan Hazard to frighten Bremen with every forward move. It was far better than anything seen in the last few weeks from the Gladbach captain, and as a result, the home side limited their guests to just 37% possession in the opening 20 minutes. Max Kruse began to drag his Bremen side into the game as the half reached its midway point. Breaking down the left the Grun-Weißen captain played the ball into Ishak Belfodil who forced Yann Sommer into action for the first time. Just as the visitors looked to be getting a foothold in the game Gladbach extend their lead. Zakaria caused panic on the far side, his dangerous cross left Nicklas Moisander in a flap – the centre back turned the ball into his own net. As the end of the half approached Raúl Bobadilla almost grabbed Gladbach’s third, the visitors once again went into meltdown in their own box – Pavlenka on hand in the Bremen goal to deny the Paraguay international the goal his tenacity deserved. Gladbach began the second half as they finished the first, on the attack. Die Fohlenelf wanted a third, as did those packed into a bitterly cold Borussia-Park. Roaring their side forward the crowd almost got their wish seven minutes into the half. Matthias Ginter, however, couldn’t steer his header on target. Werder were let off the hook, the defender should have done much better with his chance. Just as die Grun-Weißen looked capable of conceding another they just as quickly grabbed one back. Thomas Delaney was given all the space and time he needed to power his unchallenged header into the back of the net. It sparked the visors into life – Aron Jóhannsson broke through the Gladbach defensive line moments later, dancing past a static back line his wicked shot was just kept out by an acrobatic tip over from Sommer. Gladbach had gone from being in full control to displaying full on panic mode inside three minutes. As the hour mark approached the hosts suddenly found themselves in a football match. After a sustained wave of attack the visitors found the equaliser their play had deserved. Jóhannsson was to make no mistake with another sight of goal – blasting the ball into the top corner of the net the Werder fightback was complete. The visitors had flipped the fixture on its head – as the final whistle loomed it was the side from the Weser bank who looked the more likely to go on and win. 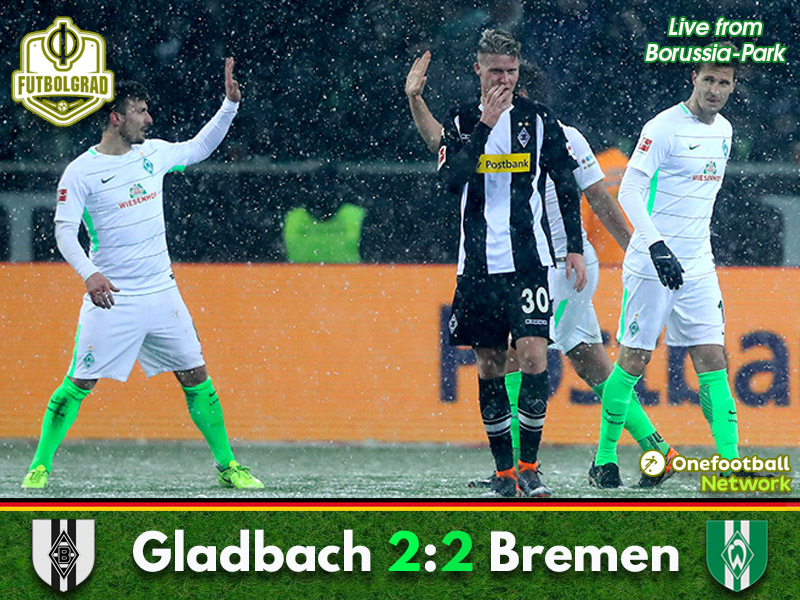 Gladbach for all their first-half dominance, were forced to share the points after a tremendous second half Bremen fight back. The Danish midfielder turned on the style in the second half to help Bremen turn around a two-goal deficit. Driving forward with pace his goal proved to be the catalyst for a wonderful Grun-Weißen comeback. Growing in confidence from his net bursting header the 26-year-old went on to police a Gladbach midfield whilst proving pivotal in building the Bremen attack – from such a terrible start the Bremen player went on to give a man of the match performance. 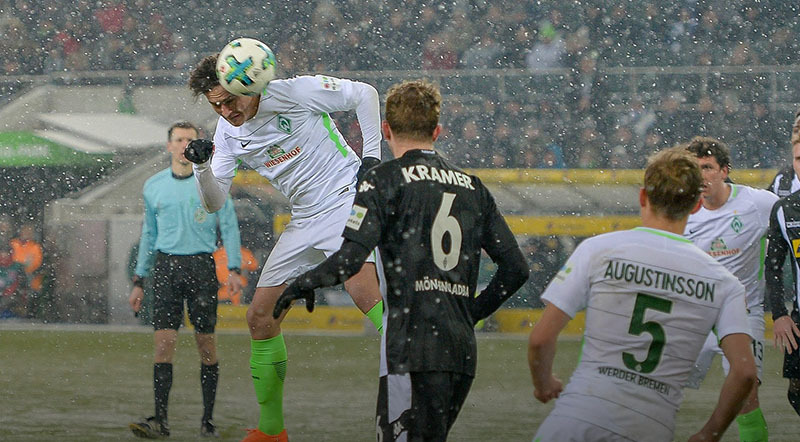 Lars Stindl could only watch on as his Gladbach side threw away a two goal first half lead. The home captain started the evening without registering a goal in 1154 minutes of play and ended it with a goalless run that powered past the eye watering 20 hour mark.